A printable PDF of the Dog-Puppy Foster application can be found here. PAWS Montclair has no facility to house rescued cats. We depend on compassionate and caring people who are willing to volunteer as Foster Parents to provide a home environment for cats while they await permanent placement. Foster homes provide a less stressful environment than a shelter, or other facility, and speeds up the socialization process by allowing the cat to interact with people. Foster Parents are essential to the welfare and proper placement of our cats as they increase the cat’s chance of finding a loving, permanent home. The online Cat-Kitten foster application can be found here. A printable PDF version is here. 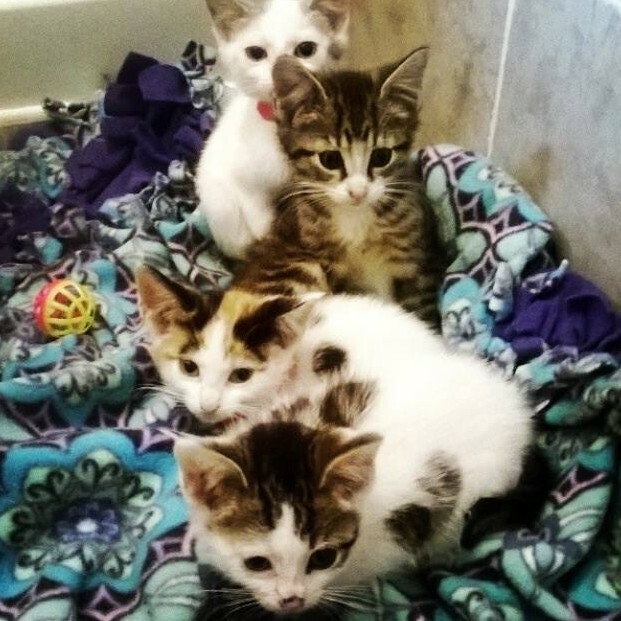 You must be able to transport the cats/kittens to and from the fostering location to adoption events and a veterinarian for treatment, when necessary. You must always keep the cats/kittens inside and provide them with suitable food, fresh water, clean litter, a warm and safe dry place to sleep, and lots of loving attention. You may need to give the cats/kittens medications or baths. Many of the cat/kittens that come to PAWS are rescued from less than ideal environments and may be dirty, have fleas, mites, worms and other medical issues. Dishes for food and water and cat/kitten food: Food and water dishes should be heavy and sturdy so your cat/kitten can’t flip them over. Ceramic or stainless steel bowls are recommended over plastic. Food should be of formulas specific for their age and growth. A litter box, cat litter, and scoop: Make sure the litter box isn’t too big for them to get in and out of easily (especially kittens), or too small so they have trouble using it. Cats tend to prefer unscented litter and open topped litter boxes. A sturdy scratching post(s): You can train them by redirecting their efforts to the post each time you catch them sharpening claws elsewhere. The scratching post(s) can be part of a cat tree or perch. A comb and brush: Regular grooming helps prevents hairballs and is an absolute necessity for longhaired cats/kittens. Grooming time is also excellent to help in socializing cats/kittens. Toys: Cats, especially kittens, are naturally quite playful. You can purchase toys, or make your own from bits of cord and wads of paper, but don’t let them eat the string or cord. Catnip is not recommended for young kittens. Never use your hands or fingers as cat toys; otherwise they will learn to play “attack” hands when petted. Places to play hide and seek and to sleep: Cardboard boxes with towels for bedding make inexpensive places for play and sleep. Cut holes in the boxes for them to go in and out of. Safe Environment: Cat, especially kittens, are naturally inquisitive and things they want to play with might be harmful to them, like the cords on blinds, electrical cords, or plants to nibble that could be toxic. They can also do a certain amount of damage with their sharp claws by climbing curtains or your good furniture. Therefore, a certain amount of cat proofing will be necessary. Litter training: Usually it is just a matter of placing them in the box once when they first arrive in your home, and again if they have an accident. If you have more than one cat, you will need more than one litter box, ideally placed in multiple locations. Most cat/kittens catch on to litter training pretty quickly. Keep the litter box clean and do not use harsh chemicals to clean it as they can be toxic. Food and water: Change water daily and provide a steady supply of food as recommended. Kittens, can eat a lot, after all, they have lot of growing to do. A few don’t for kittens under 16 weeks: No cow’s milk as it can cause diarrhea, and No seafood-based foods or raw meat. Socialization: This is the most important part of a kittens’ life! Play with your kittens, let your kids play with your kittens, carefully, or course. However, do not introduce them to other cats in your household unless they have been tested negative for FIV/FeLV. Do not mix litters unless they have been screened by PAWS Montclair to be together. Don’t tiptoe around your kittens or be afraid to make noise.